I like airplanes that slap your hands but don't hurt you for screwing up. The Husky is one. The Aviat Husky is a traveler, a trainer, or an adventurer and ready at a moment’s notice. Are you? 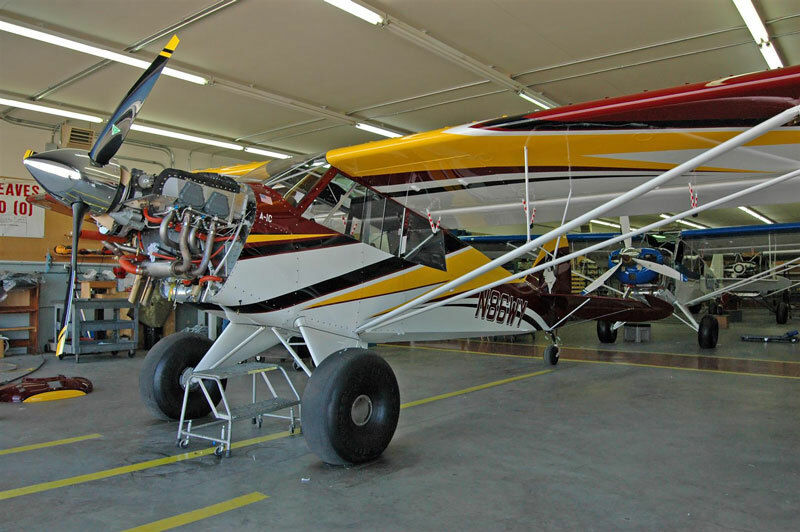 Most pilots know the Aviat Husky is a modern, tandem-seat bush plane capable of operating in and out of short and/or rough fields. But not so many know the history of this aircraft. Nobody is better equipped to tell this tale than Bob Hoff, who took delivery of the very first Husky sold and then proceeded to sell Huskys for the next 21 years as America’s #1 Husky dealer. The Hoffs still own two of the capable airplanes. First, a little deep background on the history of the company, located in Afton, Wyoming, and then we’ll have Mr. Hoff tell the rest from his unique perspective. In 1939, Reuel, Ivan, and Spencer Call began design work on a new airplane intended to allow farmers, ranchers, and hunters to access the rugged terrain of the Intermountain Rockies. Wartime scarcity of materials delayed commercial production, but, after the war, surplus engines, metal, and parts were readily available. The CallAir A-3 passenger plane, a low-wing taildragger, was the result. War-hardened test pilot Barlow Call hunted, ferried equipment, and measured snow with the new airplane, landing it in mountain fields or parking lots, and the aircraft developed a reputation as a backcountry work plane. An original Call Air ag plane at the Call Air Museum in Afton, Wyoming. Photo by Crista Worthy. By the 1950s however, pilots were buying Cessnas and Pipers. Herb Andersen joined CallAir in November 1953 and suggested they design a purpose-built agricultural airplane. By March of 1954, the prototype was ready and Herb flew it to California to begin sales. CallAir manufactured the A-5 through A-9 crop dusters until 1959, when the design was sold, first to IMCO and then Aero Commander. The factory stood empty except for a brief time when Polaris built snowmobiles there. 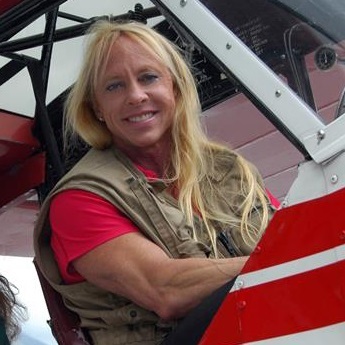 Andersen had moved to Georgia to work at Aero Commander. In Georgia, he met Curtis Pitts, designer of the Pitts Special biplane. Andersen convinced Pitts to bring his operation to Afton in 1973, where they operated successfully. Frank Christensen bought the company in 1981. Designer of the Christen Eagle, his Christen Industries manufactured both Eagle and Pitts aircraft, but aerobatic airplane sales were slow. 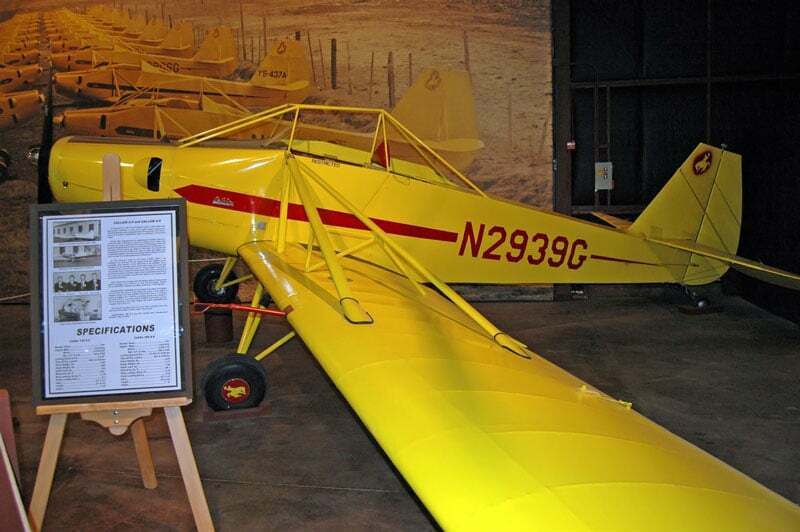 To augment their business, they tried to buy the rights to Champion or the Super Cub, to no avail (Piper wanted $1 million). So in 1985 they designed their own bush plane from scratch and named it the Husky; it was certificated by 1987. In 1990 Christensen sold out to an Englishman named Malcolm White, who changed the name to Aviat Inc. Aviat was purchased by Stu Horn in 1995. Stuart Horn arrived in Afton in early 1996, when, as he told me, the temperature remained below minus 40°F for two weeks. It was a radical change from his former life as a real estate developer in New Jersey. He loved airplanes and thought it would be fun to build them. What followed was a total immersion into the sea of manufacturing minutia and FAA regulations. When I took a tour of the Aviat facility with Horn in 2012, I was astounded at the depth of his knowledge of every facet of his business. As we walked, he outlined his sourcing and testing of metals, numerous quality control procedures, myriad design changes including improved wing spars for the Pitts, the meticulous (and unique) methods of doping/sanding/painting, with some 14 layers to produce a fabric-covered aircraft that is smooth as glass, and much more. I began to realize that what’s in his head (because it’s all from memory) is so vast it would probably take a year for him to explain it all, but I wanted to absorb every concept. Horn keeps improving the Husky; for example, in 2012 he and his team developed an improved landing gear suspension to eliminate the dreaded “taildragger bounce.” If Horn decides to modify something to achieve better performance, he’s compelled to do all it takes to understand every aspect of the problem and its solution, first by study, then by modeling, and finally by testing again and again in the field. Let him tell you why they modified the ratio of flaps to ailerons, or why the ailerons have the exact shape they do, and you’ll learn not just about the Aviat Husky, but about flight in general. I’ve never flown a Pitts, but Horn’s explanation of what it’s like to fly and land one is now indelibly stamped in my brain. An Aviat Husky under construction in the manufacturing facility in Afton, Wyoming. Photo courtesy of Crista Worthy. Most Huskys are built to spec. At one Idaho grass strip fly-in, Horn counted 22 Huskys, and no two were alike. Last I counted, there were 14 Huskys based at Alpine Airpark, on the ID/WY border. Why? 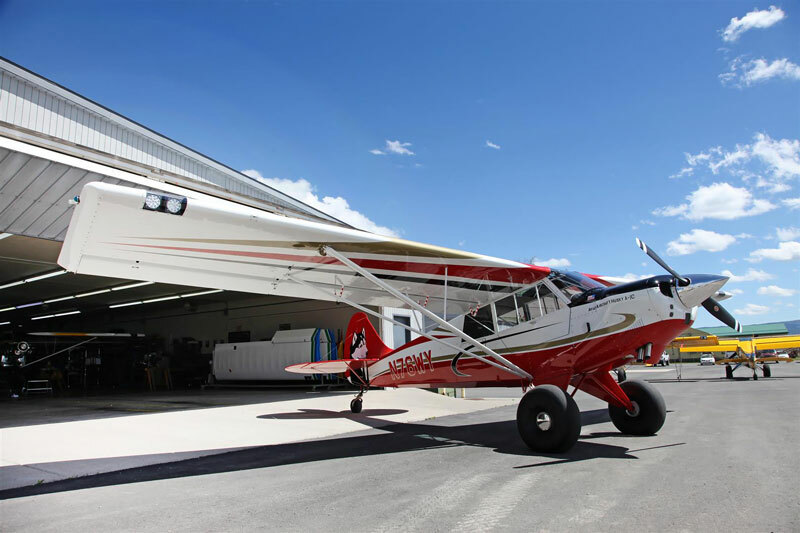 Their owners told me this is the perfect airplane for exploring the backcountry while enjoying both a low fuel burn and an unparalleled degree of luxury and comfort in a tandem-seat bush plane. The Aviat Husky factory is open Monday – Friday, 7 AM – 3:30 PM. 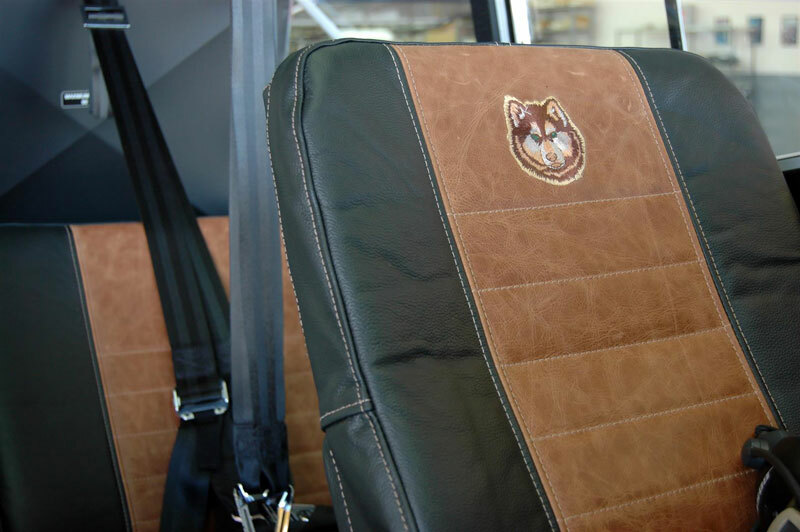 You can reach the company by phone at 307-885-3151, and visit them online at www.AviatAircraft.com. 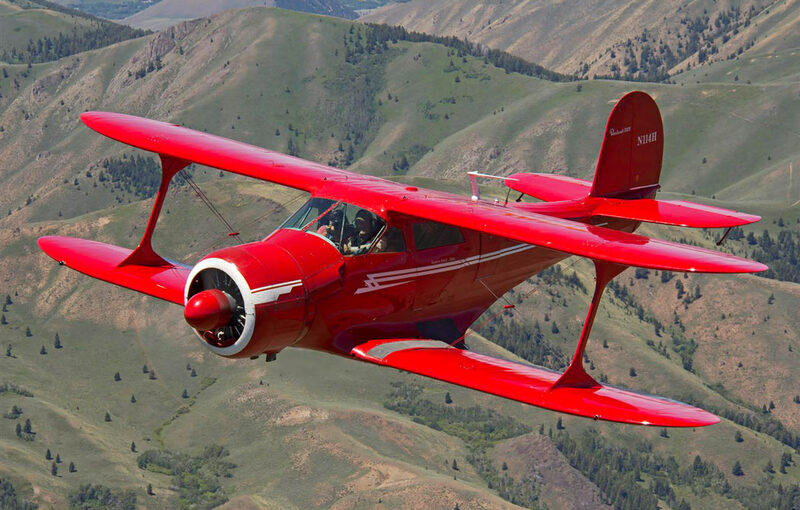 I became acquainted with Herb Anderson, manager of the Pitts factory in Afton, Wyoming, around 1972 as he would frequently come out and look at my Beech Staggerwing when parked there. Herb would show me how a lot of Stag and Pitts design is shared. Frank Christensen had bought the Pitts facility and the Pitts itself, but production was waning. Herb and Frank started looking for a product to supplement the Pitts to keep the product viable. After failing to come up with an existing design for one reason or another, they decided to start from scratch. I landed at Afton’s narrow and undulating runway November 18, 1984, just to visit and was shown a preliminary drawing of a proposed new airplane to be built there. Herb gave me a little brief of what kind of performance he hoped would be expected. Flying back to IDA that day, I kept thinking about that airplane and what it might be, given the quality and reputation of the Pitts. I called Herb back about becoming a dealer and was told there already was an adequate and existing dealership structure for the Pitts. No new ones needed. I happened to go over on July 18, 1986, just to check on progress and saw the prototype. It looked right to me, so I re-expressed interest and then flew home again. But on February 11, 1987, at Herb’s invitation, we flew the Stag over again and watched the prototype fly and saw that #1 was about ready. I asked Herb for the first one available and that’s when I became a dealer. I picked up Christen A1 Husky serial #2, N2866B, May 13, 1987, and headed home to IDA. By the time I got back, I knew Herb had a winner. Not to take from the Cub, had one in the family, but the speed and quick response really impressed me. The first one was light, with no radios or other “improvements,” making it a real delight to fly. I couldn’t wait to show one to the world, so I got permission to display it at the big EAA event at Oshkosh. Making all the arrangements for space, insurance, quarters, etc., we arrived and set up July 30, 1987, and started answering basically three questions. Is it a kit? Is it a Cub? How much? Well, we didn’t sell one but I think some were scratching their heads now and thinking about it. Also, Piper announced that production would end for the Cub after 50 more were made. But the best for me was that Budd Davisson test-flew it and gave a great report in Plane and Pilot. Getting back home, I printed brochures, got an 800 number, and would fly hundreds of miles at the drop of a hat to demo it. It finally occurred to me that the best way to sort out a real buyer was to get him to invest in it first. So I dropped the 800 number and demoed mostly at home and let the airplane sell itself. I developed a 45-minute routine using our ranch strip, 2,400 x 120 feet of smooth turf, and a shorter 1,300-foot strip at 6,500 feet elevation on our upper ranch, for simulated backcountry approaches and departures. I think more than anything, that short but exciting demo helped sell the Husky. The customer was up front so they could really experience the flight adrenaline which would be still up when we got back to the office. Selling the Husky was one of the most enjoyable jobs for me. I met so many wonderful people and still keep in touch with several. Safety was the primary goal, not only for our flight and checkouts but for the customer when he got home. With a sale, we offered unlimited, free, dual instruction, mostly given by the very best of the tailwheel instructors, Bob Jones. And I think our record showed it! Savannah Hoff taxiing at Smiley Creek in an Aviat Husky. Photo courtesy of Thomas Hoff. Over 200 new Huskys and several used sold over 21 years. From the Bahamas to Alaska and even some exported; we really enjoyed the deliveries, especially the eleven trips to Alaska, including one on straight floats and one on amphibs. And by the way, we were the first to sell both on straight floats and on amphibs. The Husky excels on floats. The first installation, on Edo 2000s with the round tops and fairings, would cruise over 120 mph and come off the water amazingly short. The big flaps just seemed to lift it out of the water without much of a run. The amphibs are nice of course, but the added weight and drag affect performance. Wish I lived in lake country; I would have to have a Husky on straights. Anyway, back to its chronology. As I said, that first one was light for a Husky, about 1,250 or so lbs. One coat of enamel and minimum dope, spartan cabin, practically no heater, so it did need some improvements and with that weight would come. The early 1990s saw better finishes and even options on color. Nice-looking seats in the Aviat Husky. Photo courtesy of Crista Worthy. The need to increase the useful load was beginning to be addressed with the A1-A in 1999, going from 1,800 to 1,890 gross weight. In 2000, with the A1-B, the gross weight went to 2,000 lbs. What was called the new wing was introduced in 2005. A shorter ‘frieze’ type aileron was used, eliminating the spade and also making the flap larger. The A1-B had a better heating system and tighter cabin, better window arrangement on the left side, typically the latest avionics and a superb finish, in virtually any color and pattern wanted. With the A1-B a second engine option became available, the IO-360 A1D6 fuel-injected with 200 hp. Also more propeller options such as the MT composite and the 80-inch Hartzell that we had certified. The A1-C was introduced in 2007 bringing the gross weight to 2,200 lbs. Lots of options were coming now, including air bag harnesses, several float and ski installations and, of course, ‘glass’ panels along with wilder paint schemes. We discontinued our dealership with Aviat in the fall of 2008 after 21 years, but maintain a parts and services agreement. We kept two Huskys in the family at their insistence. My granddaughter has soloed in one and is continuing for her ticket, flying what I consider a somewhat challenging but safe airplane for her. I like airplanes that slap your hands but don’t hurt you for screwing up. The Husky is one. 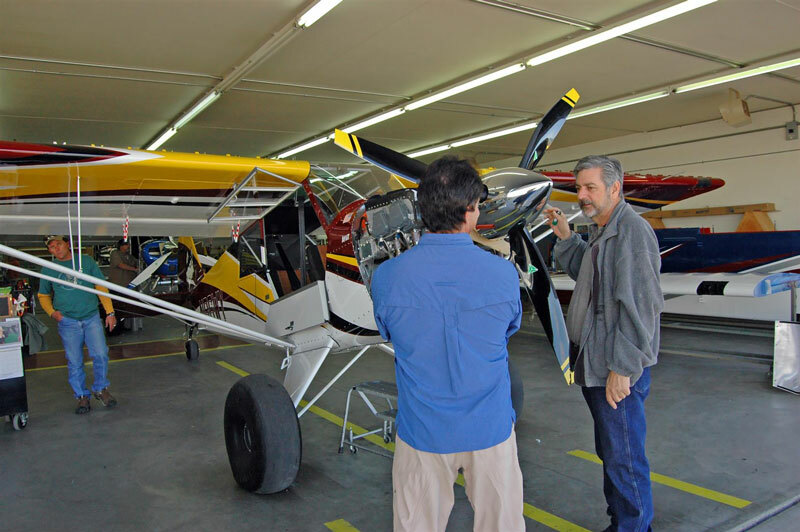 Aviat owner Stu Horn (right) talks to Fred Worthy (left) at the Aviat factory in Afton, Wyoming. Photo courtesy of Crista Worthy. I admire the owner Stu Horn’s willingness to attempt to continually improve the Husky. I have seen many innovations tried, some great and some not quite so. A new Husky is a beautiful, quality airplane with the latest in instrumentation and avionics, but like all new airplanes now, a substantial investment. I paid $55,000 for that first Husky and hoped the price could go down with production. For a while, I offered to buy the Husky back in a year if it was undamaged (less radios) if the owner was unhappy. Other than trade-ins, nobody took me up on it. My wife had been bugging me about another trip to Alaska, so last June we joined two friends (a C-185 and another Husky) and headed north. We flew up through beautiful B.C. and down the Taku River into Juneau. Then up the coast to Skagway to ride the train, and back to Juneau. Over the ice cap into Atlin, north to Whitehorse, and winding back down through B.C. and eventually home. Nine days, 3,600 miles, had a total bill of about $3,000 and everything included. We saw country that few see, ate the freshest of fish, and had sourdough hot cakes. Met the nicest people, you can’t beat that. A couple evenings ago we pushed a Husky out of the ranch hangar and headed up to check on a fencing project, observe the deer and the moose on the upper ranch, came back, and did wheelies and three points till the sun set. The Husky is just that kind of airplane. A traveler, a trainer, or an adventurer. Ready at a moment’s notice, are you? 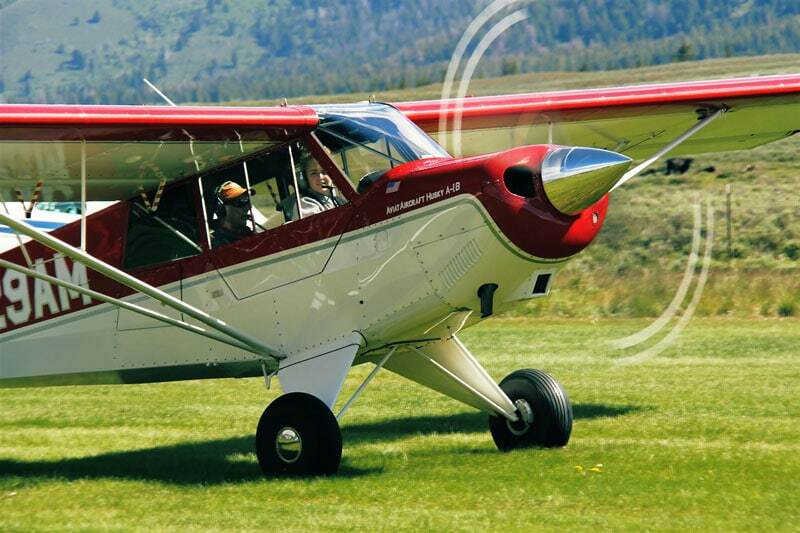 Featured Image: Savannah Hoff (Bob’s granddaughter) taking off from the Smiley Creek, Idaho airstrip. Photo courtesy of Thomas Hoff. A brand-new Aviat Husky rolls out of the factory in Afton, Wyoming. Photo courtesy of Sue Haun. Specs are taken from Aviat’s website.